Carolyn's Handmade Treasures: M5D Splish..Splash..I Was Takin' A Bath .. tweet tweet..
All content, including artwork, designs, text, and photographs are COPYRIGHT © Carolyn Miller. All artwork displayed on this site is meant to be used for creative purposes and for personal inspiration and enjoyment only. The artwork found on this site may not be duplicated for publication, resale or submitted for publication or contest submission. 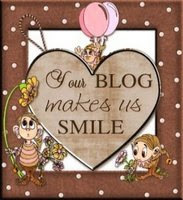 Thank you for visiting my blog and for your support. Please feel free to follow my blog and sign up for my feedburner to get all of my updates as they are posted. 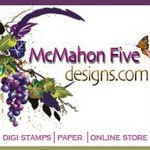 Discover the joy of creating with WOOD PAPER and other awesome items! M5D Splish..Splash..I Was Takin' A Bath .. tweet tweet..
Sooo 'tweet'!!! Love the brown embossed panel...gorgoeus sparkles!!! 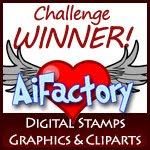 Thanks so much for playing along with TOtally Stampalcious!! Very cute card! 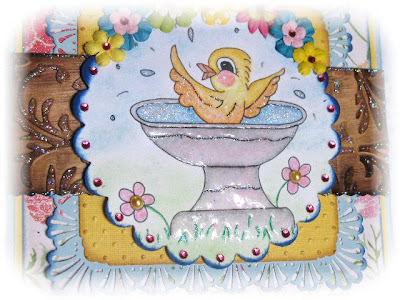 Now did you heat emboss with clear embossing powder or did you use glossy accents on the bird bath? Love it! Thanks so much for joining us at Practical Scrappers! Hi Carolyn - this is so adorable - Love that image and how you framed it so beautifully! Lovely touches with the wood paper and those pretyt flowers! Your details are always gorgeous!! Thanks for sharing Carolyn - I love it! Carolyn, this is so cute! 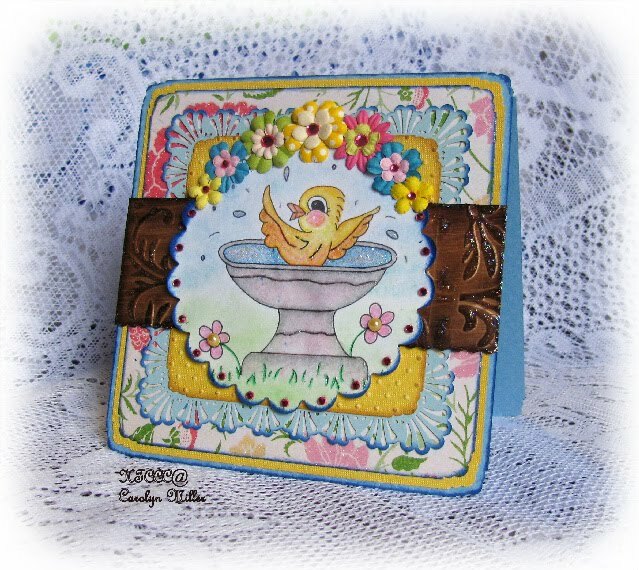 I love that little bird taking his bath! 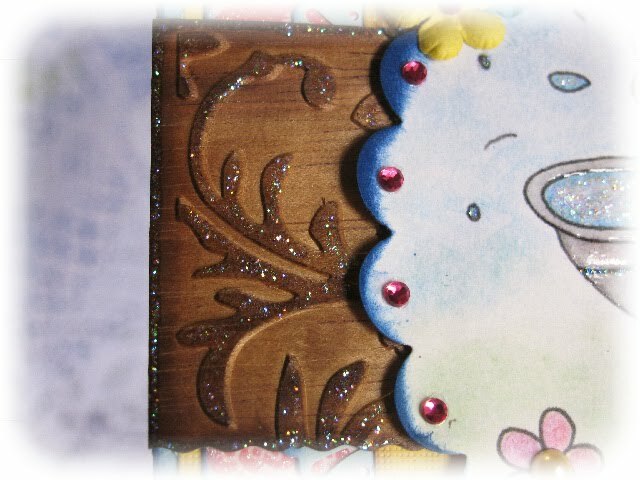 Beautiful shine and sparkle on this little beauty, and the addition of the wood paper is just such a lovely contrast. Fabulous creation, as always! Love it! Looooooooovvvveeeee your colors and what a beautiful touch with the glitter! Thanks so much for playing along with us at Totally Stampalicious! 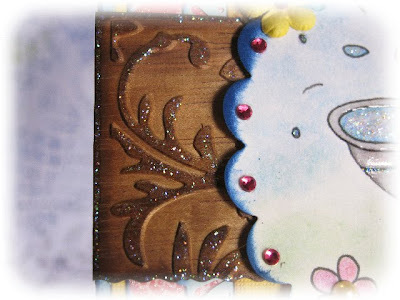 This is so adorable Carolyn done in your sweet and detailed style. Pure eye candy. Such lovely colors and pretty flowers! Thanks for joining us at S2G this week! So very cute! Thanks for playing along with us at LRW! what a cute peep! thanks for joining us at S2G! 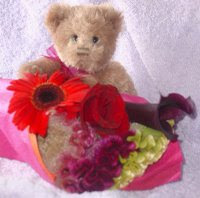 Lovely fun card those flowers set it off a treat. 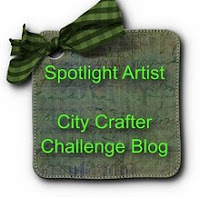 Thanks for sharing with us at Crafty Angels and good luck with the top 3. Very cute card Carolyn. Really a spring card! Fantastic!!! Love all those flowers and the soft pretty colors!!! What a sweet card! Thanks for playing along at Little Red Wagon! Super cute image and so many fun layers! Thanks for playing at Stamp Something! So cute! 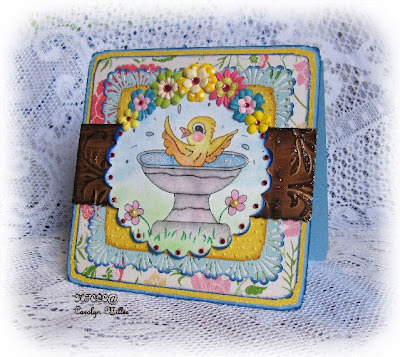 Love the little birdie and those colorful spring-ish flowers you used and layered. Wonderful colors-cute card! Thanks for playing Twisted Thursday with us at Shirleys2Girls! Great card. Thanks for joining us at Polkadoodles this week. Fantastic card! Thanks so much for playing along with us at La La Land Crafts! Pretty card! 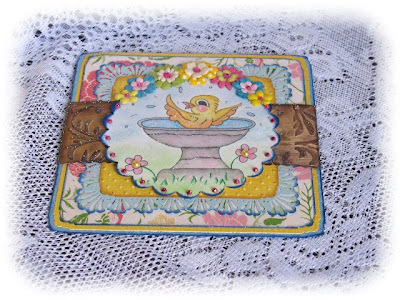 Thank you for sharing it with us at La-La Land Crafts! Adorable! This is darling Carolyn!! I just love the sweet duckie and your added sparkle!! Gorgeous texture, choice of dp and design!! You rock GF! This is just adorable, I love the colors and all the flowers etc. Fab, fun card and what a great animal image. Many thanks for joining in wit us at polka Doodles this week. What a wonderful blog. I enjoyed so much reading it. Terrific designs. Thank you so much for letting me visit. Lovely card. Thanks for taking part in the Polka Doodles challenge. Darling little peep. Thank you for joining in the Polkadoodles Challenge this week. Really cute image and a lovely card. 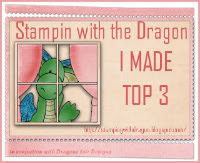 Thanks for taking part in the Polka Doodles animal magic challenge. 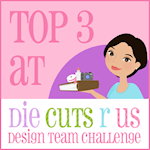 Thanks for participating in the Shirley's 2 Girls blog challenge!!! Proud Shining Star For The SSC First Challenge! Thank you, SSC! My Halloween Altered Tin made the Top 3 Pick 9/21/09 Thanks! Thank you Pink Elephant Team! Thank you for choosing my card!! 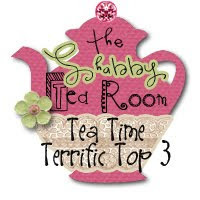 Thank you for the recognition, Susanna!! I have to add that my First Tutorial Ever made Card of the Week! Thank You, Susanna! I am going to stop adding new cards to save room, but appreciate the notice all the time, Susanna! I am so excited. 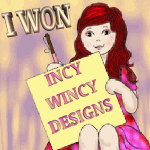 My very sweet friend, Wendy gave me this blog award. Thank you, Wendy! 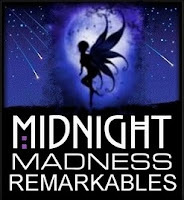 Midnight Madness Sweetheart Award awarded to me by my fellow DT members. Thanks ladies!! I have some sweet friends! 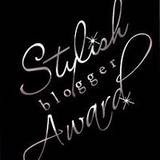 Jeni was kind enough to nominate me for another blog award. 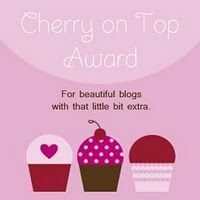 I am so honored, since I just started my blog a couple of months ago. Thank you Jeni!! Thank you Charlotte for this lovely award! Thank you Abby for sharing this award with me too! Thanks again, Sue. 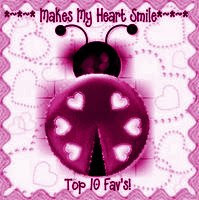 Your's makes me smile too. 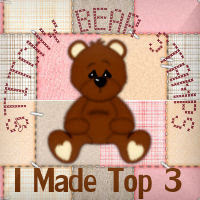 Cute Teddy Bear Blog Award from Charlotte. Thank you! Thank you Charlotte for this awesome award! 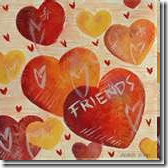 Thank You For Being A Sweet Friend! Thank you for your treasured friendship, Chris! 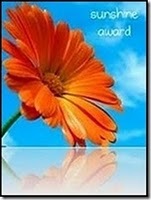 Blog Support Award From My Friends, Sue and Michelle! Thank you ladies for being such wonderful friends! 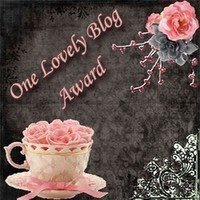 Thank you, Susan for this wonderful blog award!